PiggyBac transposon tools for recessive screening identify B-cell lymphoma drivers in mice. Front-line management of indolent non-Hodgkin lymphoma in Australia. Part 2: mantle cell lymphoma and marginal zone lymphoma. The effect of tyrosine kinase inhibitor interruption and interferon use on pregnancy outcomes and long-term disease control in chronic myeloid leukemia. Stage I non-Hodgkin lymphoma: no plateau in disease-specific survival ? ‘It is a journey of discovery’: living with myeloma. Improvement in Parameters of Hematologic and Immunologic Function and Patient Well-being in the Phase III RESONATE Study of Ibrutinib Versus Ofatumumab in Patients With Previously Treated Chronic Lymphocytic Leukemia/Small Lymphocytic Lymphoma. Translocation (X;20) involving the inactive X chromosome in a patient with myeloproliferative disorder. Safety and efficacy of pegfilgrastim compared to granulocyte colony stimulating factor (G-CSF) supporting a dose-intensive, rapidly cycling anti-metabolite containing chemotherapy regimen (Hyper-CVAD) for lymphoid malignancy. Prolonged haematological toxicity from the hyper-CVAD regimen: manifestations, frequency, and natural history in a cohort of 125 consecutive patients. Siltuximab, a novel anti-interleukin-6 monoclonal antibody, for Castleman’s disease. 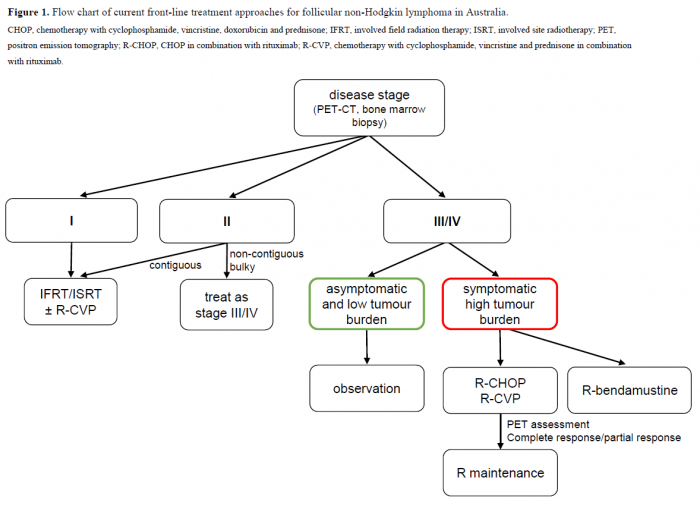 Front-line management of non-Hodgkin lymphoma in Australia. Part 1: follicular lymphoma. Impact of histologic subtypes and treatment modality among patients with primary central nervous system lymphoma: a SEER database analysis.